Please leave us a review on our Facebook page as well! We can also be found on Instagram and YouTube! Make sure you like and follow our pages while you are there. We truly appreciate all the reviews that we receive. We strive to make sure that our customers are happy with their new puppy and that the positive words get out about our breeding program. Drax has been in our family for just over three weeks, he is about 14 weeks old, he amazes us everyday. Granted we are diligently working with him, but his aptitude is outstanding. He was house trained in 2 days with only one minor accident on day 3 due to human error. When Drax needs to go outside he brings the corresponding person one of their shoes!! He figured that out all on his own. We started Puppy 101 immediately and he mastered Sit, Down, Sit in the first session. The second session he schooled all the others in Come and even followed it with Sit directly after. He Waits patiently for his leash amd politely walks out the door. He is 14 weeks old. He is attentive, assertive, and gentle with his bite. 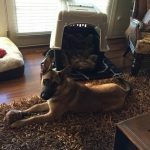 The care that Derrek and Kara and their family put into their dogs is overwhelmingly evident even in these early stages with Drax. We are an active family and expect Drax to be a part of everything we do. He is learning the ropes and meets new experiences with confidence. 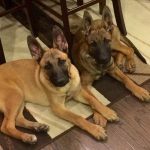 We are so pleased to have found Derrek and Kara and even more pleased to have Drax (from Karma & Chief) in our lives. We already know we will get another dog from them in the future. Hello, Derek and Kara! Today is Ragnar’s 7 month birthday! He is doing great and is truly a remarkable dog. He is very funny and affectionate and loves to play. We have been having him professionally trained since he was 5 months old and our trainer has fallen in love with him. She says he is remarkably confident and intelligent. He already does heel, sit, down and place….all off leash! 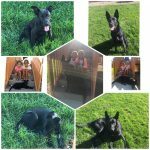 He is very active and loves to run as much as he likes to walk. We have been doing doggy day care every day during the week and he does awesome with other dogs. The staff at the day care love him as well. We also have taken him every weekend to Bass Pro Shop and he does great with people as well. 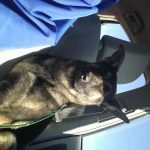 Ragnar is truly the dog we have been searching for and will be an integral part of our family for years to come! Thank you for your breeding program and your dedication! Ursa, is just over one year old. She is a beauty, invested in obedience classes, she is proud, fast, a strong athlete and smart. Love her, thought you may enjoy seeing what a fine dog she has grown to be. I knew when I picked out Flint at 10 weeks he would be good dog, but I never imagined how GREAT he actually would be. Flint potty trained in 2 weeks, learned all the essential commands in 1 week, and has been a dream of a dog. He will hike, run, play ball then turn around and chill on the couch for hours, sit quietly in a busy coffee shop at my feet, or stay still and quiet in a long car ride. He is amazing with all kids and dogs. Whenever we are in public everyone comments on how handsome he is or how well behaved he is. I have honestly hardly had to correct any behavioral issues, he is just naturally well behaved. He is so loving, but yet is so protective. He is by far the best dog I have ever owned. My husband and I are so impressed we are coming back in September to get a second! I am loving her! I take her with me wherever I go (great traveler) but when she has to stay home she’s good with her crate. She hasn’t played with the tennis ball yet but she likes her rope tug and her Kong. In just 1 short week she’s great at heeling (seemed to do that without any coaching), she’s figured out “sit”, “down” and “stay” (for a short time). She learned how to go up and down stairs with confidence. We are working on getting her to accept the cat…making good progress. She has barked once…at the cat. My grandkids (ages 4 and 6) love her. She is so gentle and calm with them. Our sweet Duchess could not have come into our lives at a better time. She is a perfect fit for our family. She is gentle with our two year old and we are so happy he will get to grow with her. We couldn’t be happier with our decision to make the trip to CO to get her. The whole experience was once in a lifetime and we are forever grateful. Derek took the time to speak with me at length about all our concerns and questions. They truely are creating the perfect “lassie” dogs. Thank you for helping our family heal from the loss of our Duke with the gain of our Duchess! Kita is now two years old. She is protective and loyal and smart. She fits right in here and is excellent with all the livestock. While I try not to pick favorites amongst my dogs, she just might have a slight edge!!! 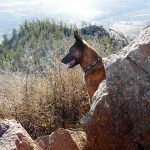 My Malinois has changed my life. He is protective, intelligent, amazing with children of all ages, and we share a connection that is once in a lifetime. This dog has brought me so much joy and companionship. 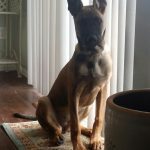 I decided to get a Malinois when I moved to a new city and lived alone. Ace is so smart and can predict a threatening situation. He knows the difference between play and when to be protective/defensive and amazes me everyday. The past two years I have watched him learn and develop a personality. He has been around children and adults of all ages and is so gentle. 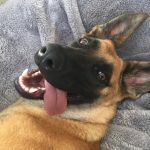 He is the happiest dog I have ever met and shows endless love. Derek has been so great. 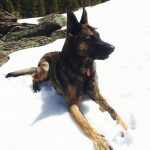 Ace is my first dog and Derek helped me through the process and addressed all of my concerns. I had been researching breeders for a year before I came across Countryside Kennels. I knew from the moment I spoke with Derek that this would be the perfect choice. I am so grateful to have found Ace, no person or animal could ever replace him. I picked up Zeus at 8 weeks old and have not had a second thought about it one time! He’s 7 months old now and is an absolutely amazing dog, everywhere we go people compliment him on his looks and his temperament. Everything Derek and Kara say about their dogs is 100% accurate, Zeus can play all day long with every kind of dog but knows how to turn it off when it’s time to. I get compliments daily on how well behaved he is at only 7 months old! I’m so happy that I found Countryside Kennels because Zeus is everything I was looking for in a dog. 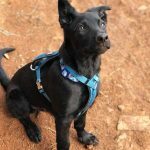 Its been 2 months since we picked up raven. Shes been doing great. Loves to go for hikes in the mountains and loves camping. She goes to work with me everyday and we walk every morning. When the car door opens shes ready to go. 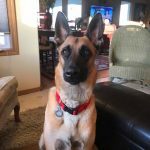 After years of loving the Malinois breed, but knowing my household was not a good fit for their “exuberance”, I found Derek and Countryside Kennels. Gauge arrived here in Oregon at 10 months of age. I have owned a fair amount of dogs in my life, having competed in agility, but have never felt the same bond as I have with Gauge. 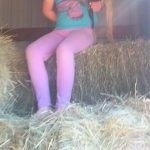 I have no worries about my 6 year old daughter playing in the yard as Gauge is always right there with her. He’s protective yet kind, loyal yet loves all other dogs, bonded and incredibly goofy. 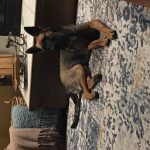 We love his personality, love having the piece of mind having him around gives us and love having a “maligator” who can lay at our feet quietly. Can’t imagine not having him around. We brought Bane home a little over a year ago now, and it was the best decision we have ever made. Bane comes from Chief and Rios, and he truly embodies the perfect dog. Not only is he incredibly intelligent, he is sweet, funny and loving. The time we spent training him never seemed like work- he is quick to adapt and loves to be challenged. We walk him down the street and EVERYONE comments on his temperament and coloring/size/beauty- then when I tell others he is only one year old, they do not believe me! He is very trustworthy and loyal. He loves children, people and other dogs. 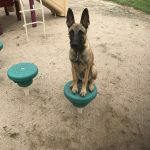 He balances play and rest really well- never too hyper and knows how to “turn it off” when we need him to. He is our best friend and we can’t wait to have him with us for all our adventures. This picture is of Ginger, at 4 months old. Everything they promised, they delivered!!! 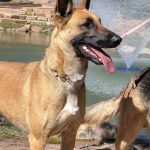 They breed the best Belgian Malinois mixes available, anywhere!!! A year ago yesterday we visited your farm and brought home Dash. He is the best dog and we are so happy with him. What a great temperament he has! 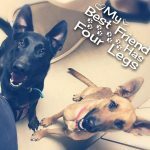 Everything you say about your dogs on your website is absolutely true. He weighs between 85 and 90 pounds, depending on how much exercise he is getting. I have had Arlo for more than a year now and he is a big part of the family! He is so smart, gentle, playful, protective, beautiful, and great with kids. He has exceeded in obedience school, being the top of the class, as well as the youngest dog there at the time! I have had so many people come up to me, complimenting me not only on how beautiful he is, but that they want to take them home and keep him for themselves! Thank you so much, Kara and Derek, for breeding the best dogs and my best friend! I got the dog i was looking for!! Ill be back in the future. 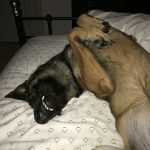 My husband was searching for a smart AND obedient dog and found Countryside Kennels online. After much research and talking to Derek for over an hour, we decided one of the pups would be a good match. 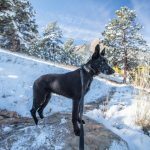 I was concerned about a “big” dog as we had a dachshund and a basenji already at home. Derek assured us that one of the pups would be great for the “pack”. We ended up with a GORGEOUS female that people literally stop in the middle of the road to ask about. 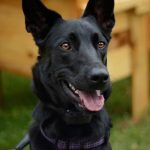 Midnight has been with us just shy of a year, and the whole process of her coming to live with us in Virginia was easy and she is absolutely wonderful. She went through training with a professional trainer and we are able to walk her off leash around the neighborhood and we take her out wherever we go. We love her and she has been a great addition to our family! Thank you Derek and Kara for such a precious gift! KAT is the best dog on the face of the earth!!! Thanks Countryside!!! Bonne is the dark brindle and Pip the light brindle. I got Bonne when she was 7 months old to be my Service Dog for PTSD. She has been the easiest to train and the best thing that ever happened to me. I got Pip when she was almost two and I trained her to be a therapy dog for Soldiers. 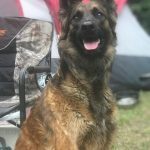 I served 20 years as a medic in the Army and if you are looking for a dog to be your service dog Derek is the one to go to. 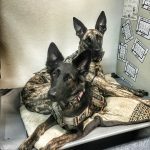 They are Sisters and have been the best dogs I have ever owned. Thank you Derek for changing my life and putting them in mine. Hey a big thank you for letting us visit your Countryside Kennels, It was an incredible experience. We are so impressed with you all and your dogs. It was also amazing watching them interact in your home with the kids, other dogs and cats. We have now had our Zoey for a few weeks now and she is everything you said she would be – it’s amazing!! She is so smart, a quick learner and for only 8 months old is so calm. Of all the dogs we have owned in our lifetime she is the absolute best!! Archer is intense, loyal and the smartest dog that I have ever had, including purebred German Shepherds and Malamutes. He loves to run in the Mountains and is a great friend. I want more of Derek’s dogs. We got Allie and Jax from Countryside when they were 4 months old. 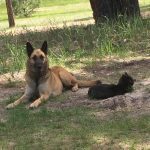 Both are absolutely beautiful, well mannered dogs that have the look of a Belgian Malinois with the gentle temperament of a German Shepherd. Derek did a fantastic job answering our questions and explaining how they breed these amazing dogs. It was a great experience and we’re already planning a trip back for another pup! 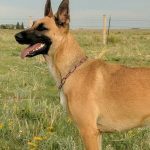 I thought I wanted a purebred Malinois until Derek explained his breeding philosophy and all the advantages I would get from his program. 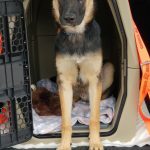 There has not been one dull day since picking up Dax.. (July 30,2015) This dog can do everything. 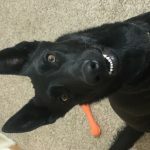 He is great with my kids, protective of our family, excelled at obedience classes, and is a pure clown! Derek has always been great with my questions, extremely helpful with any concerns I might have and always available. When we get our next pup Countryside Kennels will be the first place we call! I cannot recommend Countryside Kennels enough, great breeder and awesome dogs! We got an older pup (6 month old) from Countryside in 2016 and could not be happier. 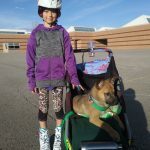 Our pup Imgi is an amazing dog, good natured, highly trainable, and well socialized. 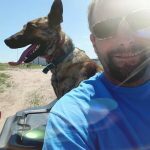 Derek has been an excellent resource and his philosophy for breeding dogs is the best I have seen. I will never get another dog elsewhere. City - State What is your City & State name?